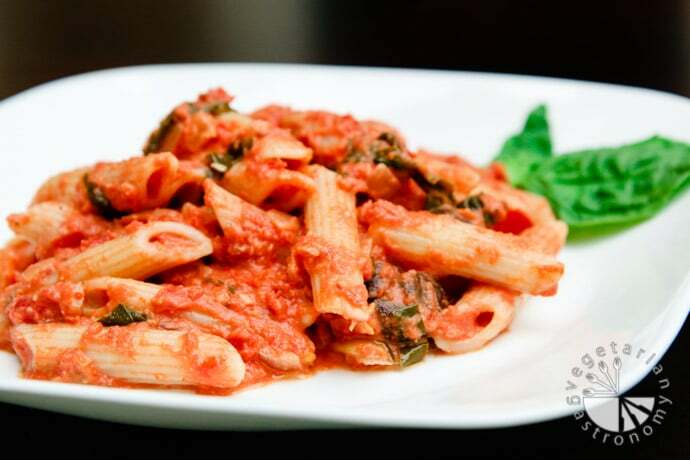 At Italian restaurants, I have always had the problem of deciding between a red tomato based pasta dish or a rich creamy based pasta dish until I came across this pasta sauce which combines the best of both worlds – Pink Sauce! This by far is my favorite sauce to go on any Italian pasta dish. 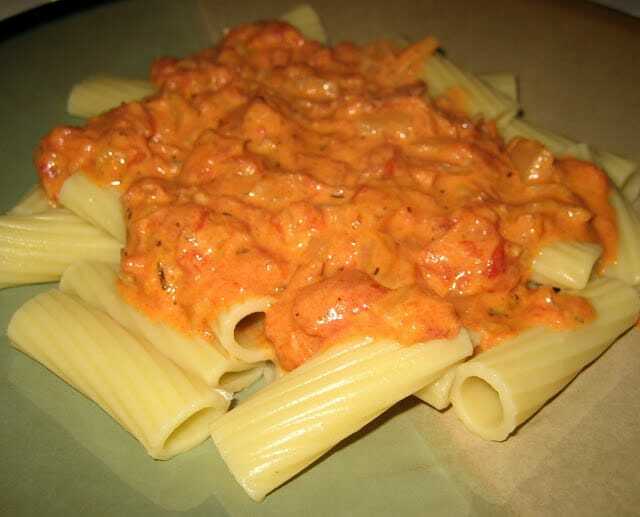 If you don’t prefer the flavor of vodka or don’t have any laying around in your house, I’ve made this recipe several times with and without adding it, and the pasta tastes amazing either way. I also love adding roasted sliced red bell peppers or sauteed mushrooms to the dish to add some veggies. For a gluten-free option, use any gluten-free penne pasta. One of my favorite gluten-free pasta brands is De Boles which you can get at most grocery stores. UPDATE – I recently revamped this recipe and developed a vegan version using cashews!! I absolutely love the taste and flavor. I have updated this recipe below to include a vegan and non-vegan version. Enjoy! Stir the cream (heavy cream or cashew cream) into the sauce and cook for about 20 min or until the sauce has thickened to liking (note that if you are using cashew cream, you may only need to cook for a few minutes to get the desired thickness). I live by this pasta at school! It is my absolute favorite! Because it's hard to buy a lot of groceries for just one person, I actually buy the canned tomatoes with the garlic and basil and all that good stuff already in it. I sautee the onions, and then add the tomatoes and then the cream just like the recipe! This turns out great everytime! I made this sauce today and I recommend being careful how much crushed pepper you put in as it makes the sauce spicy. My husband and I like spicy, but my mom and mother-in-law would never eat it this hot. I did not put the vodka in and made a double batch so I could freeze some for later. Very tasty. Next time, I will use crushed tomatoes instead of diced. You have some great suggestions! You an always add red crushed pepper later on each plate so yes feel free to reduce or eliminate the amount of spice just to be careful. If we have vodka in the fridge we use it, but I've also made this several times without the vodka and to me it doesn't make much of a difference either. And great idea on freezing the sauce! If you have not already tried it, one of my other favorite sauces to freeze is pesto! I spoke too soon in my last post. I made this early in the afternoon and then put it in the frig to reheat for dinner. After letting the sauce sit for a little while, it was not that spicy. My husband loved this meal and he actually really liked the diced tomatoes in the sauce. I am going out on a limb this time and going to try it with the whole wheat pasta. I've had it a few times with both whole wheat pasta and brown rice pasta/rice pasta (for a gluten-free option)...both taste great! Of course the whole wheat pasta is a little more grainier, so depends on your preference, but I thought they both tasted good. I purchased both of those pastas from Trader Joe's! Made a half portion of this earlier this week so I could have it for lunch for a couple of days. I'm a lazy med student so I bought the canned tomatoes with basil, garlic, and all that good stuff already in it! I had some mushrooms and broccoli lying around so I threw that in there as well while the onions were cooking and it was delicious as always. Took me less than an hour to make and got multiple days worth of lunch out of it! This is my favorite pasta recipe...sooo good! And yes it's perfect to save some for later! You can also freeze some of the sauce (without the pasta) to use later on!